Open to the public on weekends and seasonally during weekdays. The Warren Skaaren Environmental Learning Center (ELC) at Westcave Preserve opened to the public on the vernal equinox, March 22, 2003. The ELC functions as a visitor center and also offers much needed classroom space for the Preserve's public and school programs. The building is a model of sustainable building design, and includes such features as ground-source heating and cooling, a solar energy panel, and a rainwater harvesting system. 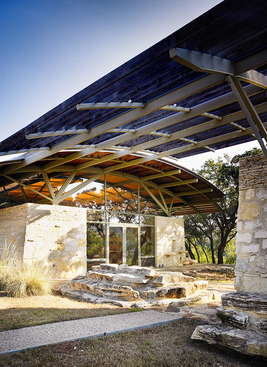 Project architect Robert Jackson's remarkable work was recognized with a 2003 Merit Design Award from the Austin Chapter of the American Institute of Architects. Integrated exhibits at the ELC illustrate how the forces and cycles of nature have interacted to create and sustain this unique sanctuary. The ancient elements -- earth, water, air, fire -- are used to explain Westcave's geology, water, weather, and energy and their connection to the Preserve's plants and animals. An aperture in the ceiling of the ELC allows a spot of sunlight to be projected on the floor of the solar exhibit. Visitors can track the movement of the sun across the sky to understand the relationship between the sun and the earth at different times of the year. This exhibit uses a series of numbers known as the Fibonacci Series to explore the relationship between math and nature. Illustrations depict the geological history of Westcave Preserve over the last 250,000 years. This exhibit highlights the water (or hydrologic) cycle as it occurs at Westcave Preserve. This exhibit explains the weather microclimate at Westcave Preserve. This exhibit explains the importance of and ways to protect the dark sky as a natural resource. An Internet-based, self-updating exhibit from the Space Telescope Science Institute portrays the beauty and power of the universe and guides the viewer to a deeper understanding of astronomy. Are you looking for a meeting place that will inspire creativity, harness focus, and promote productivity? Look no further than Westcave Preserve - the natural treasure of the Texas Hill Country. Westcave's award-winning Environmental Learning Center (ELC) will provide the perfect space for your next meeting or day retreat. 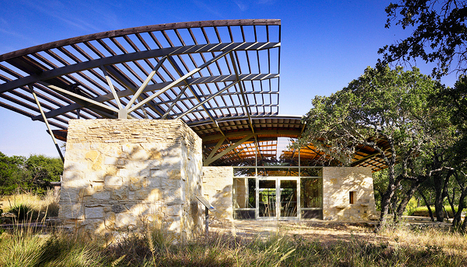 The ELC is nestled under native Ashe juniper and live oak trees atop a scenic cliff overlooking the Pedernales River. The building is a model of sustainable building design and includes ground-source heating and cooling, a solar energy panel, and a rainwater harvesting system. The ELC can accommodate 65 people comfortably and be configured in several ways to best meet the needs of your group.